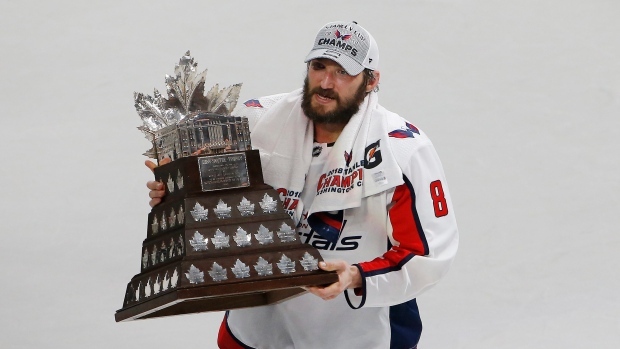 We already knew that Washington Capitals captain Alex Ovechkin won the Conn Smythe Trophy as the National Hockey League's most valuable player during the playoffs following the team's five-game triumph over the Vegas Golden Knights in the Stanley Cup Final, but now we know how. For the first time ever, the Professional Hockey Writers Association released the full ballots of each of the 18 members who voted to hand out the award. Voting was tallied with 10 minutes remaining in Game 5. With each member submitting a first, second and third-place vote, points were awarded in a 5-3-1 format to determine the winner. Ovechkin received all but five of the 18 first-place votes to defeat teammate Evgeny Kuznetsov, who received the other five, by a count of 80 to 64. The second-place vote was the mirror opposite with those who didn't give a first-vote to Ovechkin giving him second choice, while the 13 who did vote for Ovechkin picked Kuznetsov for runner-up. In 24 playoff games, Ovechkin scored 15 goals and added 12 assists. For his part, Kuznetsov led the playoffs in scoring with 12 goals and 20 assists. Third-place votes all went to goalies with Braden Holtby of the Capitals receiving 16 votes, while Golden Knights goaltender Marc-Andre Fleury claimed two in a losing effort. The Russian-born Ovechkin becomes just the fourth European player to win the Conn Smythe, following the Detroit Red Wings' Niklas Lidstrom (2002) and Henrik Zetterberg (2008) and countryman Evgeni Malkin of the Pittsburgh Penguins (2009). The PWHA will also be releasing full ballots for the NHL Awards set to be handed out on June 20 in Las Vegas.